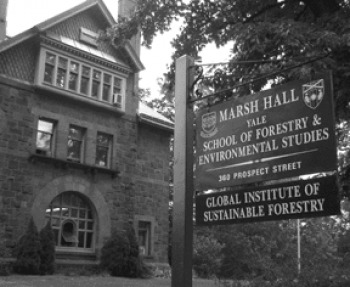 Established in 2000 by the Dean and a group of FES faculty members, the Global Institute’s mission is to integrate, strengthen, and focus the School’s forestry research, education, and outreach to address the needs of the 21st century and a globalized environment. The Global Institute fosters leadership through innovative programs, creates and tests new tools and methods, and conducts research and supports sustainable forest management both domestically and worldwide. The Global Institute works primarily through FES faculty-led programs. It also partners with other Yale centers, and cooperates with institutions in the U.S. and abroad. FES students play a significant role as research assistants, interns, and field crew at the School Forests, and take on high levels of leadership in planning activities and events, and contributing to publications. The Global Institute also relies on an External Advisory Board made up of international leaders in all aspects of forest management and conservation, as a connection to those who are involved in the more practical aspects of protecting, restoring, and managing the world’s forests.